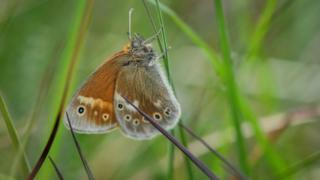 A small bog in Lancashire is once again home to a rare species of butterfly, for the first time in 100 years. 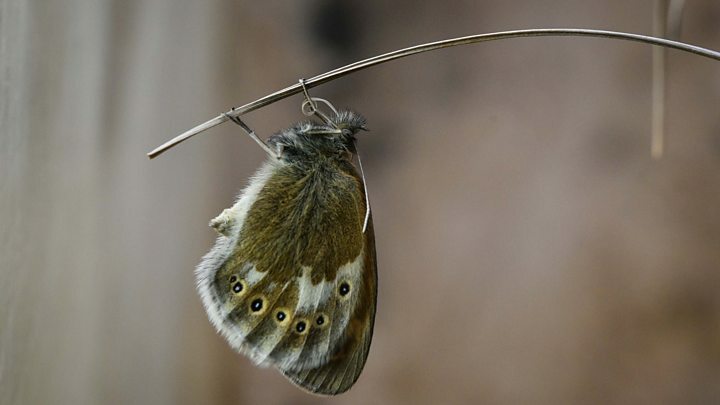 The large heath butterfly has been disappearing from northern England, where it was once common. But after three years of careful captive breeding, scientists from Chester Zoo say they have established a stable wild colony at Heysham Moss. Only two other locations in Lancashire play host to this fluffy brown species, which thrives in low, damp boglands. "They've not been at Heysham for at least 100 years," said Heather Prince, an invertebrate keeper at the zoo. "They've found museum specimens that date back to the 19th Century, labelled Heysham, so we know they were there historically." But in Lancashire and elsewhere, disruption of their peatland habitats saw numbers plummet, Ms Prince explained. Drainage is good for farming and housing, but bad for bog-based bugs like the large heath butterfly. "They used to be so common that one of its names was the Manchester argus. But obviously now in Manchester, you'd probably never ever see it." Back in 2004, Lancashire Wildlife Trust started re-wetting Heysham Moss: removing drainage ditches and birch scrub, and re-planting the heath caterpillar's favourite food: hare's-tail cottongrass. Then four years ago, Chester Zoo commenced a project with the trust to bring back the butterflies themselves. "Back in 2012 we collected the foodplants - we gave them a year to take root and get established at the zoo," Ms Prince told BBC News. "Then in 2013 we collected the first group of females, and released them into prepared breeding enclosures." One year later, the first harvest of caterpillars was ready for their re-introduction. "We actually rummaged through the enclosures and found all the pupae. We used non-toxic glue to attach them to sticks, which we hung on a sort of rack and carried them to Heysham Moss." There, a netted enclosure was checked daily by guides from the wildlife trust, who noted how many males and females had emerged before setting them free - one by one. Nearly 400 butterflies have been released over three summers, Ms Prince said, and the signs are good. "We've seen the full life-cycle occurring. And we've definitely seen mating occurring while we've been releasing the butterflies. So they're happy in their habitat." The Heysham population will now be monitored through to 2020, and Chester Zoo will keep its cottongrass enclosures in case further assistance is needed. Ms Prince hopes this won't be necessary. "I'd be happy to work with them again, but if it has been a success then I'm absolutely overjoyed," she said.